Another use for my jars! With our warm weather, my plants have been doing very well and the flowers have been blooming nicely. I have officially become my mom and MIL. I used to make fun of these resourceful women for hording used jars. They would obsessively wash used jars that held pickles or mayonnaise. My MIL spends a lot of time at their second home and take lots of road trips. So she likes to use the jars to hold foods that she can't finish or need to move with them. My mother just thinks that buying a jar with food in it is a lot better bargain than buying an empty jar. So lately, I've been "seeing the light" and have been saving some of my used kimchi and pickled food jars! What do I use the jars for?? I use it to bring in my breakfast to work! I love that the jars have lids that are liquid tight so I can bring milk and soups in them. I am also obsessed with other uses for the jars, like using them as candle holders. The possibilities are endless! My jar breakfast at work. Hope everyone had a wonderful Easter. 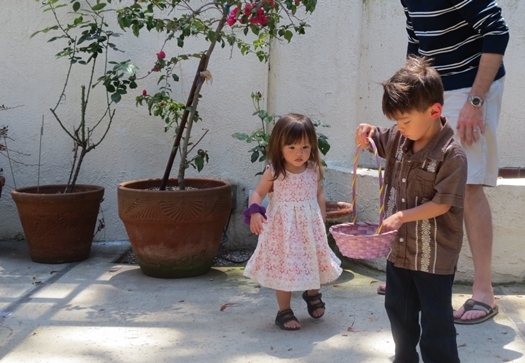 We had the kids' Great Aunt and Mr. BAW's friend over for dinner and the kids had a great time with a minnie egg hunt in our backyard. Buzz was very quick this year and found all of the eggs! Ahgoo followed him around and we made Buzz stop to let her pick up a few of the eggs. 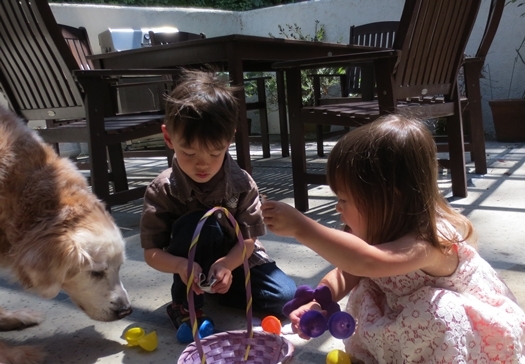 I hid the eggs and distributed some at low levels so that Ahgoo could get them on her own. But I failed to realize that Buzz immediately saw them and grabbed them! Luckily, she didn't care too much. We had amazing weather on Easter. It was warm and comfortable so we ate outside for the first time since moving into the house. I even screw in all of my string light bulbs and lit candles. The kids entertained themselves at the slides and enjoyed riding their bikes after dinner. 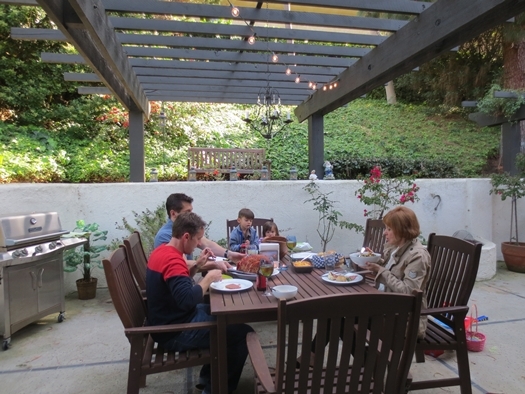 We can't wait to host more dinner parties outside as we get more daylight. Checking out the prizes inside the eggs. Even Toby came over to investigate! Al fresco dining at its best. Guess who got her very first haircut ever??! 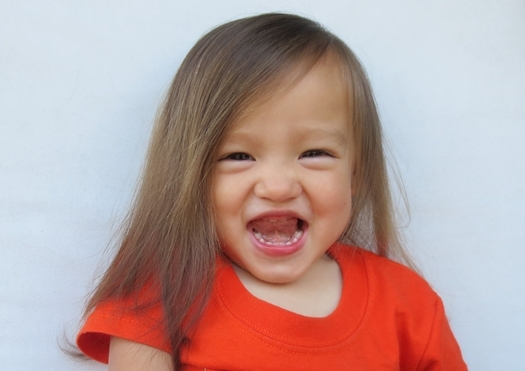 That's right, I changed Ahgoo's entire look by giving her her very first haircut! Buzz got his very first haircut at eight months old but I just didn't want to touch Ahgoo's hair for the longest time. Buzz's hair is pin-straight but Ahgoo's hair has beautiful curls. So I just let her grow out her gorgeous hair. But as her hair thickens and lengthens, I have to clip or tie up the front each morning so her hair doesn't cover her face. She used to ignor hair clips but then she started pulling them off her head. So I would have to use rubber bands so she can't pull them off (see her hair in the picture in the previous blog below). But lately, she's been more and more impatient with her hair routine in the morning so I finally decided to give her bangs. This way, she doesn't have to use any hair products in her hair. I think she's adorable with bangs! But it does change the way she looks drastically! One day after her new haircut, Mr. BAW kept saying, "She looks soooo different!" 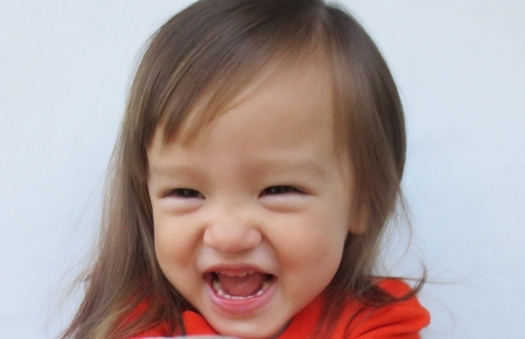 Plus, the next day, Ahgoo's new haircut was a the talk of the entire pre-school! All her teachers love her new look, especially one, Ms. Nancy, because they now both have the same haircut! Oh, and I kept a lock of her hair for keepsake. I love this little girl so much! Here she is sporting bangs!! 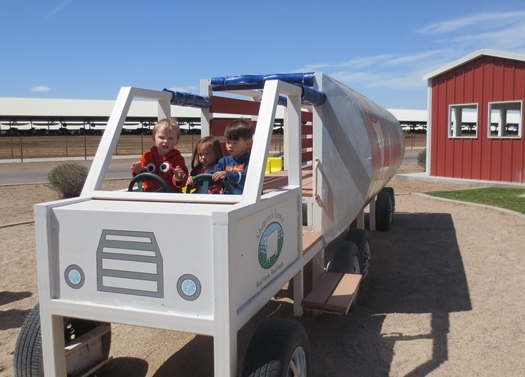 On our trip to Arizona last month, my In-laws booked a tour for the entire family at the Shamrock Dairy Farm! 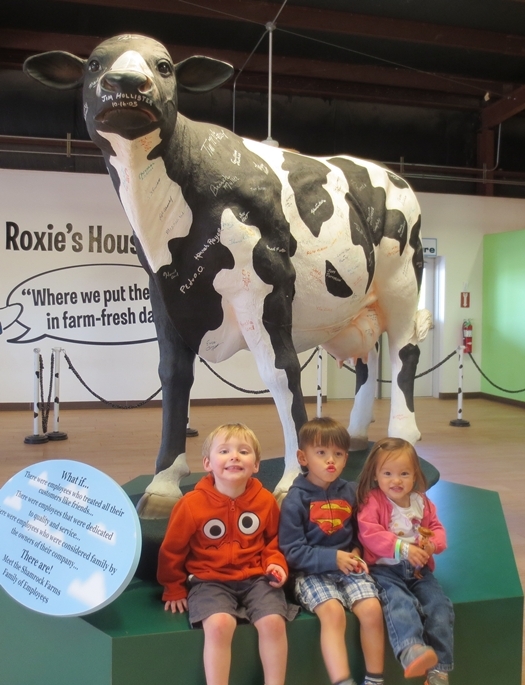 They've never been to it before but thought that the kids would enjoy seeing cows and where milk comes from. 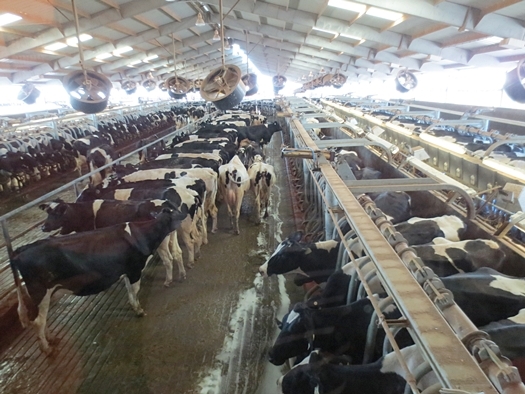 They were right, only it wasn't just the kids who enjoyed seeing the cows! I LOVED it! 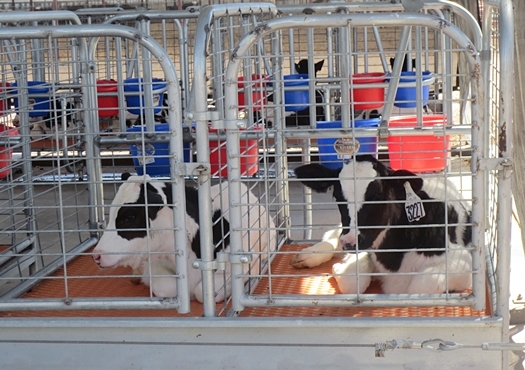 My favorite part of the entire tour was seeing the baby cows!! They were SO cute! 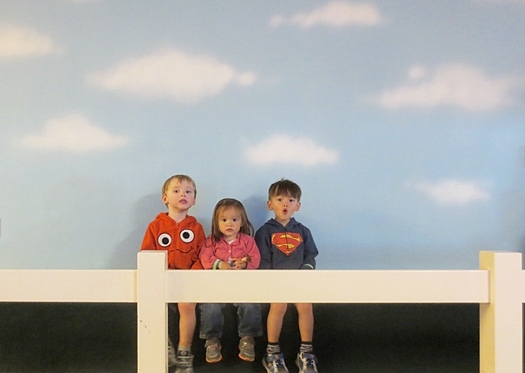 They were kept in their own individual "cribs." 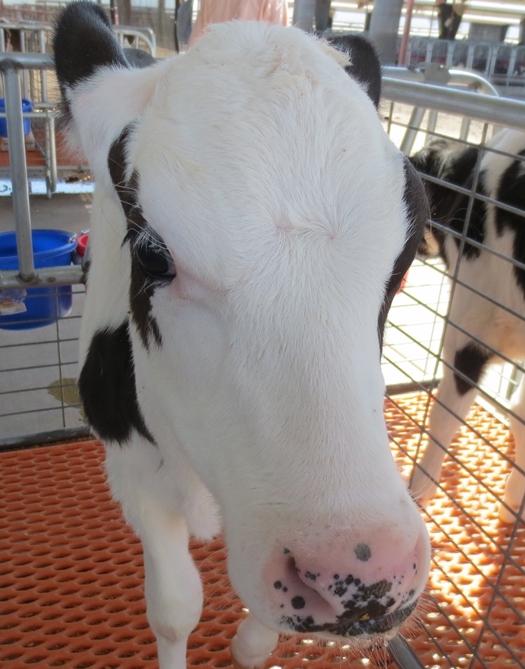 As part of the tour, we got to pet and feed the baby cows, my favorite part! 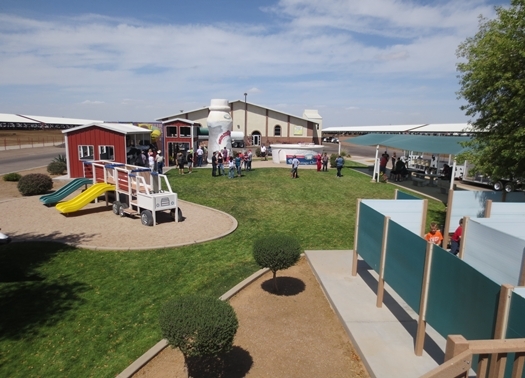 The farm also has a large play area for the kids with slides and tractor to ride on. And of course, a trip to the Dairy Farm is not complete without ice cream! I recommend booking a tour if you've got young kids and are out in the Phoenix area. The only thing I have to warn you is that the farm is not just open to the public, you can't just drive up to the farm and wander around yourself. 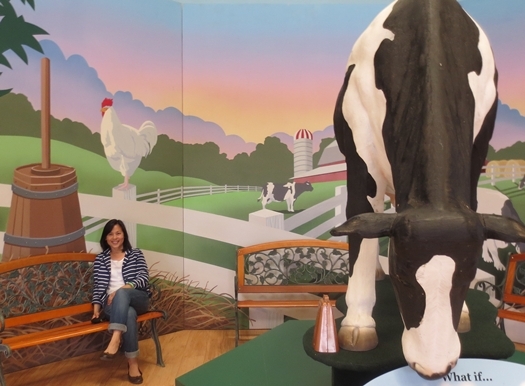 You can only visit the farm through the tours. And, there's literally nothing outside of the farm for miles! 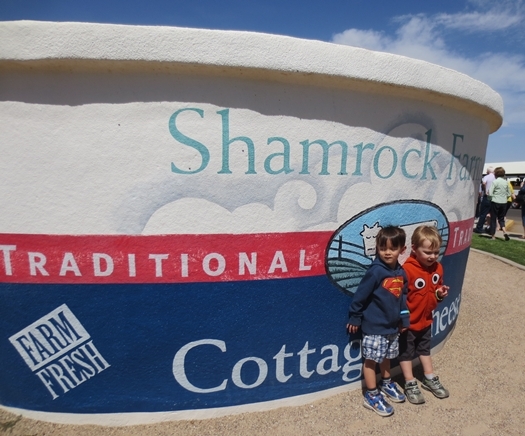 Enjoy our pictures from the Shamrock Dairy Farm. Hanging out "on the farm!" A giant tub of cottage cheese!!! 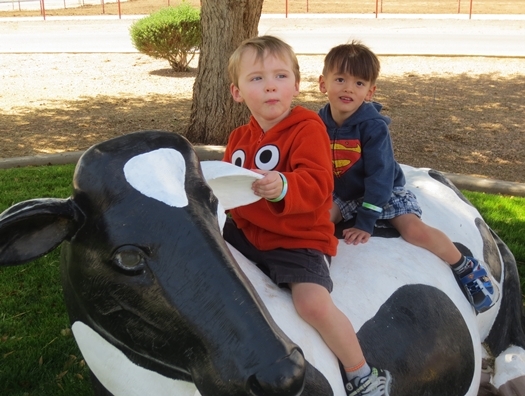 The boys on a cow. The nursery! These babies are seriously adorable. Here he is, in full glory! There are lots of wild peacocks roaming the streets of our neighborhood. Since the time change, we've been taking little walks after dinner with the kids to look for these giant birds. We can ususally hear them quite loudly in the late afternoon hours, sometimes I can even hear them from our bedroom. Finding them isn't difficult either. They walk freely across streets, fully expecting cars to stop for them. The kids love looking at the birds walking around. The peacocks are fairly social and hang out in groups. There's usually a couple of males following a female around or a female with her kids walking around. They are quite agile too, we've seen them hop onto a fence and even walk along it. Thus far, we don't know of any problems residences have with them. Hopefully, they just continue to be graceful and peaceful neighbors. These peacocks are absolutely beautiful, their deep blue and green colors glisten in the sun. Life with two kids is just so fast paced that the the days just fly by. In a blink of an eye, our little princess has just turned TWO years old!! She has become such a smart and feisty little girl that we are completely in love with her. At two, she's loves to sing and dance. She can sing "Twinkle twinkle little stah, how I wonder what are." She also echos EVERYTHING her big brother says in the car to and from school. She's started saying to me,"Mama, I want to tell you something." eventhough she doesn't really have something to tell me. She just hears her brother saying that all the time. If you ask her why she does something, she'll respond with "campus why?" It's her version of "Because why?" She also has a great sense of humor, she'll laugh at something in a cartoon and will say, "That's funny!" She'll ask for a vitamin each morning after breakfast, only she calls it "babalin." She loves to imitate a kitten's meow and loves to look for our neighbor's cats. She also loves to go peacock hunting, yes, we have wild peacocks in our neighborhood. That's the subject of my next blog! If her brother does something she doesn't like, she'll yell "I don't like it!" Her favorite vegetable is corn, though she will eat most about anything I give her. Her favorite fruits are oranges, grapes, and bananas...in that order. She LOVES Woody, Buzz, and Lightning Mcqueen...in that order. She also loves Minnie Mouse and carries a stuffed one everywhere she goes. She's always asking for a band aid for her pretend "boo boo." 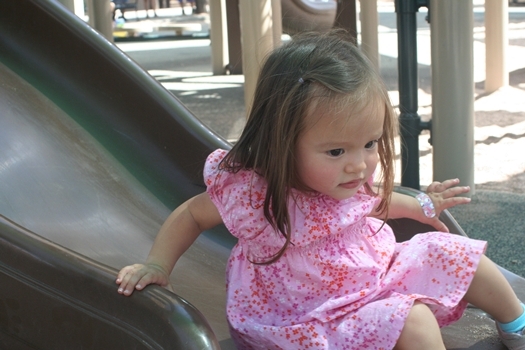 You'll notice her "boo boo" on her left hand in the picture below. Usually, she'll sport two band aids, one on each hand. 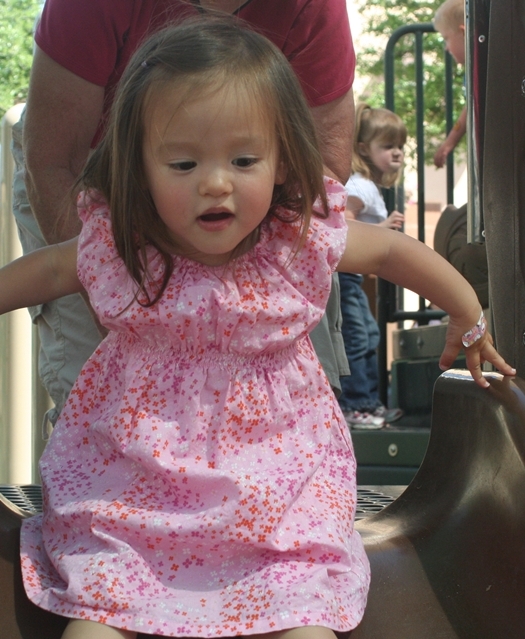 But I think one fell off at the playground. Even before she turned two, Ahgoo has started to participate in Chinese class. She's doing very well and are learning to say a few words in Chinese and understands everything I say to her. She also tried out Soccer Shots for the first time a few days ago and loved it! She also LOVES swimming and we'll probably start her on swim lessons soon. Last month, I hinted that we have big changes coming up again. We had recieved news that the kids preschool is closing due to budget cuts. This news came suddenly and most of the parents were shocked. But luckily, we already found a new school for the kids. It will be Buzz's 4th school in 4 years of life and it will be Ahgoo's 3rd school! But I think both kids will adjust well and make new friends quickly. I can't wait to see what antics our little baby girl will come up with in her third year of life! Sliding with Grandma at the Train Museum in Phoenix. Happy birthday to our little princess! 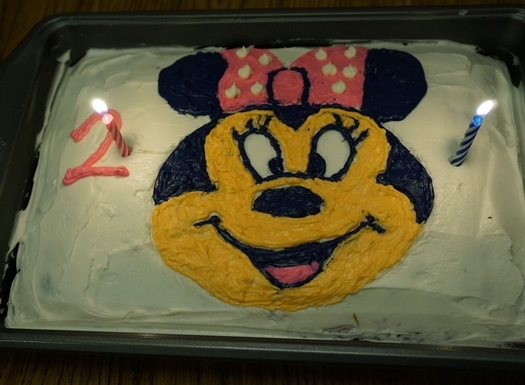 Grandma baked her this cake and I decorated it. I initially was going to make Curious George but decided on Minnie Mouse after Ahgoo fell in love with her stuffed Minnie.